Please contact us via email at ncitechtransfer@mail.nih.gov or call 301-624-8775. SAVE THE DATE! The 2018 Technology Showcase is tentatively scheduled for Wednesday, June 13. 2018. Thank you to the more than 200 attendees of the 2017 Technology Showcase. The event provided a great opportunity to learn about NCI and Frederick National Laboratory for Cancer Research (FNLCR) technologies available for collaboration and licensing and to connect with biotechnology professionals across the Maryland/DC region. If you were not able to attend, you can still benefit – and we look forward to seeing you next year. In the coming weeks, we will post the technology presentations to the event page, 2017TechnologyShowcase. Save the date! Join us next year for the 2018 Technology Showcase scheduled for Wednesday, June 13. The 2017 Technology Showcase, an inaugural, half-day event that will showcase technologies being developed at the National Cancer Institute (NCI) and Frederick National Laboratory for Cancer Research (FNLCR) to encourage startup company formation, technology licensing, and collaborations. The Tech Showcase will introduce the Frederick, Maryland community to regional technology development stakeholders, and will highlight available resources. The event will feature short technology summaries presented by NCI and FNLCR innovators, as well as presentations from regional stakeholders involved with technology development and commercialization. An interactive poster session by innovators and technology ambassadors will concurrently occur, and there will be opportunities for networking throughout the event. The NCI Technology Transfer Center (TTC) has fellowship opportunities available to qualified candidates in the fast growing field of technology transfer. This fellowship opportunity combines a science, legal or business background with a new career in technology transfer. The TTC is responsible for negotiating agreements, promoting research partnerships with NCI scientists, and the patenting and licensing of NCI technologies. TTC also has a unit dedicated to marketing and outreach for these research opportunities and their underlying technologies to potential collaborators and licensees. This experience prepares the Fellow for technology transfer positions within universities, industry or the federal government. The TTC has offices in Rockville and Frederick, MD. Applicants should indicate the position(s) and location(s) of interest in their application. There are current openings for both the Combined and Negotiator Fellowships. Other duties as pertaining to intellectual property management and technology transfer. This fellowship opportunity is designed to develop the unique skills associated with both negotiating technology transfer agreements and marketing a large portfolio. Approximately 50% time will be dedicated to each function. Acting as one of the liaisons between the NCI and outside parties requesting additional information on collaborative/partnering opportunities. • Excellent writing and speaking skills. Stipends are determined by the level of education and number of years of experience post-graduation. Starting stipends for those with no experience are: Master's degree $35,500; Ph.D. $50,800. Starting stipends are higher with relevant work experience in technology transfer and/or additional, applicable degrees. Stipends are paid monthly in arrears. Health benefits are provided. Annual stipend increases may be given on the Fellow's anniversary date. DHHS/NIH/NCI are Equal Opportunity Employers. George N. Pavlakis, M.D., Ph.D., head of NCI’s Vaccine Branch and John T. Schiller, Ph.D., deputy chief of NCI’s Laboratory of Cellular Oncology, were recognized as leaders of academic invention by the National Academy of Inventors (NAI) and were elected to NAI Fellow status in December 2016. Both Dr. Pavlakis and Dr. Schiller have made significant scientific contributions in their respective fields. Dr. Pavlakis “has authored more than 200 publications and is named as an inventor on more than 50 US and International Patents.” Dr. Schiller, along with NCI’s Douglas Lowy, Ph.D., is known for leading “the initial development and characterization of human papillomavirus (HPV) prophylactic vaccines that ultimately became the commercial vaccines Cervarix and Gardasil.” HPV is the most common sexually transmitted infection in the United States, and a few types can lead to cervical and other cancers. To learn more about these technologies and others invented by Drs. Pavlakis and Schiller available for development through collaboration and/or licensing, please contact: TTC Invention Development and Marketing. To learn more the NAI Fellowship announcement, see: National Academy of Inventors Announces 2016 Fellows. The National Cancer Institute (NCI) was the recipient of two "Excellence in Technology Transfer" awards at the Federal Laboratory Consortium (FLC) Annual Meeting in April, 2016. The award “recognizes employees of FLC member laboratories and non-laboratory staff who have accomplished outstanding work in the process of transferring federally developed technology,” explains the FLC. To learn more about why NCI received this recognition as well as the individuals behind them, see below. “Development of First Immunotherapy to Treat Chordoma, a Rare Bone Cancer” was selected for exemplifying excellence in technology transfer process because of the complexity and the dedication of the team involved. 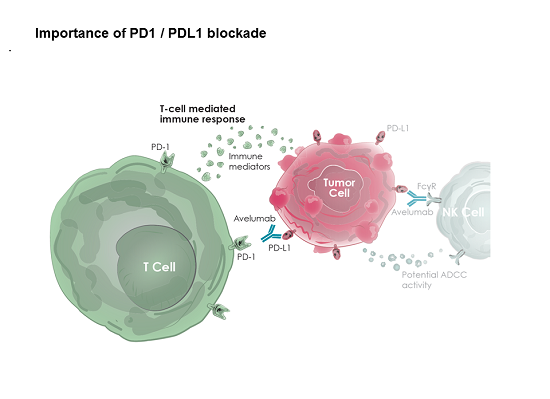 To help advance NCI’s discovery of a vaccine capable of inducing a specific, targeted immune response against cancer cells expressing the brachyury protein, NCI formed collaborations with three commercial partners to develop brachyury vaccines. These collaborations led to the rapid translation of investigational therapeutic vaccines with the potential to revolutionize how researchers and physicians treat many cancers. Furthermore, the collaborations led to new intellectual property, licensing activities, and the management of several issued patents and pending patent applications. While NCI’s commitment to collaborate with multiple partners is helping to realize the discovery’s full potential, the resulting, rapid scientific process has required careful management of a complex technology transfer process. To learn more about the outcome from one of the collaborations, see: Vaccine Therapy for Unresectable Chordoma. Prior to a groundbreaking discovery by scientists supported by the NCI, fewer than 40 percent of children with high-risk neuroblastoma lived five years after diagnosis. Now an immunotherapy 30 years in the making, ch14.18, UnituxinTM (dinutuximab), is providing new hope for infants and children with this rare cancer. On March 10, 2015, the U.S. Food and Drug Administration approved Unituxin™ (dinutuximab also known as ch14.18) as part of first-line therapy for pediatric patients with high-risk neuroblastoma, a rare cancer that most often occurs in young children. On August 17, 2015, the European Commission (EC) also granted Marketing Authorization for Unituxin. “Discovery to Commercialization: New Immunotherapy for Rare Childhood Cancer, Neuroblastoma” was recognized by the FLC for exemplifying T2 excellence. It was a remarkably productive, collaborative effort between the National Cancer Institute (NCI), the Frederick National Laboratory for Cancer Research (FNLCR), the Children's Oncology Group, and United Therapeutics Corporation (UTC) resulting in commercialization and approval. L. Mary Smith, Ph.D., United Therapeutics Corp. 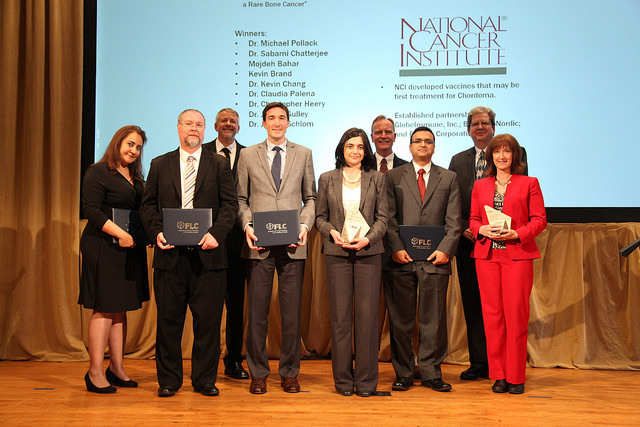 The National Cancer Institute’s Technology Transfer Center (TTC) received a Group Award for “The Establishment of a Patenting and Licensing Program at the National Cancer Institute.” The award was presented to Karen Maurey, Director of the NCI Technology Transfer Center, at the NCI Director’s Awards Ceremony on October 20th, 2016 on the NIH Campus in Bethesda, MD. The citation merits special honor since patenting and licensing of inventions is a primary mechanism to translate NIH discoveries into health care products in support the NIH. For over 25 years, the NIH Office of Technology Transfer has conducted patenting and licensing for NIH and its Institutes and Centers. On October 1, 2015, these patenting and licensing functions were decentralized into nine offices embedded in the NIH Institutes, including NCI’s TTC. The staff of TTC are commended for their extraordinary achievements in successfully launching the first patenting and licensing program at the National Cancer Institute. Specifically, the NCI TTC assumed responsibility for 5,883 active patents and patent applications and 120 open license negotiations on behalf of NCI and nine Client Institutes within TTC’s service center (serving NCCIH, NEI, NIA, NICHD, NIDA, NIMHD, NIHCC, NIHCIT, and NLM). Combined, this constitutes the largest of the decentralized docket, comprising 55% of the total NIH program. Transitioning operations for this complex portfolio – while concurrently meeting statutory deadlines and maintaining agreement negotiations – required sustained and exceptional performance and teamwork. TTC’s administrative staff and contractors worked together to implement critical operational components for the expanded functions. established a new Invention Development and Marketing Unit to provide resources and specialized expertise in opportunity analysis that helps to produce more informed patenting decisions and costs. This new Unit will also increase the visibility of NCI’s inventions for partnering through digital marketing, the Startup Challenges program, the Invention Development Program. The National Cancer Institute has partnered with the Center for Advancing Innovation (CAI) to launch the Nanotechnology Startup Challenge in Cancer or NSC2. The Challenge is centered on commercially viable, nanotechnology cancer-related inventions conceived by the NCI. Once accepted into the Challenge, international teams will compete by selecting one of these intramural inventions, and creating a business plan to launch a startup. Alternatively, teams may also elect to bring other commercially viable, nanotechnology cancer-related inventions into the challenge that are not from NCI. The primary goal of the Challenge is to stimulate the creation of start-up businesses to advance development and commercialization of these nanotechnology inventions. NSC2 started accepting entries on October 12, 2015 and will continue to accept them until March 14, 2016. Those teams will then move into the second phase of the challenge and work to create and present their business plans and pitch to a panel of judges spanning industry, venture capital, serial entrepreneurship, government and more . To learn more about NSC2, the inventions, and how to enter, visit http://www.NSCsquared.org. NSC2 is the third NIH Startup Challenge and is based upon the award-winning model created by the Breast Cancer Startup Challenge, followed by the Neuro Startup Challenge (see Challenge.gov Celebrates Five Years of Open Innovation). 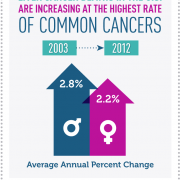 In March 2016, the NCI, in collaboration with the American Cancer Society, the Centers for Disease Control and Prevention, and the North American Association of Central Cancer Registries, released its Annual Report to the Nation on the Status of Cancer, 1975 - 2012. The report reflects progress and improving trends in the survival rate for most cancers; however, it highlights an increase in the death rate for liver cancer. NCI has technologies ready for collaboration with commercial partners that could positively impact the fight against liver cancer. Contact us to learn more about these technologies and how to partner with us.